The role of an online travel agency, or OTA for short, has become increasingly important within the hotel industry, because they provide a convenient way for customers to compare hotels and to book them over the internet, from the comfort of their own home, or on the go. 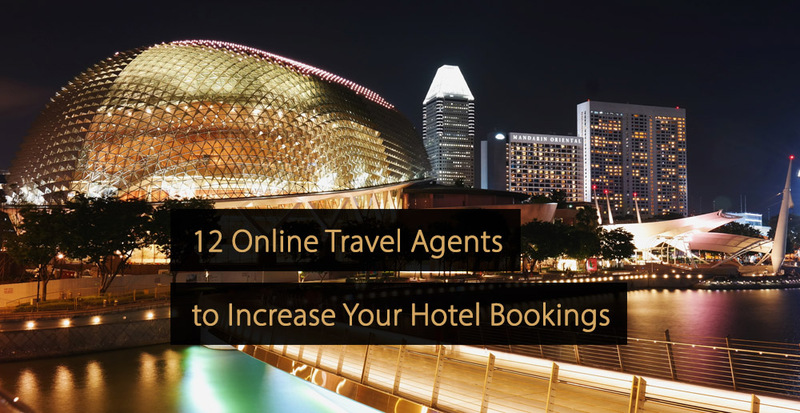 In this article, you will find out more about online travel agents and the best platforms to turn to in order to increase the number of hotel bookings you attract from customers. What is an Online Travel Agent (OTA)? Why Are Online Travel Agents Important? How Does Commission Work With Online Travel Agents? How to Distribute Your Hotel Inventory With All OTAs? An online travel agency, or OTA, is a website or online service, which sells travel related products to customers. These products may include hotels, flights, travel packages, activities and car rentals. Crucially, OTAs are third parties, reselling these services on behalf of other companies, including those in the hotel industry. Typically, an OTA will offer many of the benefits of using an offline travel agency, with added convenience and more of a self-service approach. They will also include a built-in booking system, allowing for instant bookings. Although online travel agencies can play a vital role in terms of distribution, allowing those within the hotel industry to reach a wider audience, it is important to understand that your own website should always be the number one priority. After all, bookings made through your website do not require you to pay commission to a third party, which is important for revenue management, as it maximises the amount of money you actually receive. You can find some useful tips for gaining more bookings through your own website in the article “8 Tips To Gain More Bookings With Your Hotel Website”. Online travel agents are increasingly important for hotels, because they serve as both a marketing and a distribution channel. A growing number of potential guests now turn to OTAs to search for their hotels, because they function as a kind of ‘one stop shop’, allowing them to easily search for hotels, read reviews, and compare prices. In addition, hotels that are listed on online travel agent websites can also benefit from what is sometimes referred to as the ‘billboard effect’. This refers to the fact that OTAs can provide a form of advertising, making their users aware of the hotels on their platform. After gaining this awareness, users may then decide to research a hotel and perhaps even go on to make a direct booking through the hotel website. Effectively, online travel agents make bookings on behalf of their users, and they make money by charging a commission fee to suppliers. The precise fee can vary significantly from service to service, but is generally a percentage of the amount paid by the customer. In most cases, the commission fee is paid either after the customer has made their final payment, or after the travel itself has been completed. The commission fee varies per online travel agent. For example the commission of Booking.com could be somewhere between 10 and 15%, whereas Expedia charges between 18 and between 25%. Higher fees can be charged in exchange for a higher ranking within search results. This is the trade-off for those in the hotel industry, because an OTA can help them to sell rooms, but it is also likely to be one of their most expensive distribution channels. There are a wide range of online travel agencies on the market and it is an industry that is growing all the time, especially as new technology emerges. Nevertheless, below you will find 12 of the most significant OTAs. Booking.com is owned by the same company as Priceline, and is one of the oldest online travel agents, having been originally founded in 1996. The business has its headquarters in Amsterdam, in the Netherlands, and the website has listings which cover close to 200 different countries around the world. Like many OTAs on the market, Booking.com offers users the ability to book hotels, motels, holiday homes and other similar accommodation types, while also functioning as a travel fare aggregation service. Click here to list your hotel to Booking.com. Expedia.com is a travel booking service and the main OTA operated by the Expedia Group, which also owns a number of subsidiaries. It is based in Bellevue, Washington, in the United States and was founded in 2001. It is one of the highest grossing travel companies in the world and has localised sites in 40 countries. Customers can book hotels, holiday homes, B&Bs, flights, rental cars, activities and other travel services. In terms of marketing, it places an emphasis on cheap and affordable accommodation. Click here to list your hotel to Expedia.com. Hotels.com is a service which allows users to book hotels, B&B accommodation and condos online. It is based in Dallas, Texas, in the United States and is owned by the Expedia Group. The platform operates on an international scale and a huge part of its business model is based on repeat business. Indeed, a major component of the company’s offering is the ‘Hotels.com Rewards’ scheme, where users can claim a price reduction after every 10 overnight stays that are booked through the service. Hotels.com is part of The Expedia Group. Since Hotels.com is part of the Expedia Group, your hotel will visible on Hotels.com when listed to Expedia. Click here to list your hotel to Hotels.com. Agoda.com is a global accommodation booking service, which is based in Singapore. Like several other OTAs on this list, it forms part of Booking Holdings; the parent company behind Booking.com. The Agoda network provides users with a choice of over one million hotels or holiday homes, with a strong focus on the Asian market, although it is increasingly targeting Europe and the Americas too. In terms of its approach to marketing, the company places a strong emphasis on providing customers with cheap or discount accommodation. Click here to list your hotel to Agoda.com. As previously stated, Priceline.com is owned by Booking Holdings, the same company that operates Booking.com. However, the Priceline.com company has its headquarters in Norwalk, Connecticut, in the United States. Click here to list your hotel to Booking.com. The main difference between Priceline.com and Booking.com is that Priceline.com focuses even more heavily on the discount travel market. To achieve this, it offers a ‘Name Your Own Price’ model, where customers are able to set their ideal price, location and hotel star level, and the service will then find a suitable option. Since Piceline.com partnered up with Agoda.com, your hotel will visible on Priceline.com when listed to Agoda.com. Click here to list your hotel to Priceline.com. HRS.com is an online travel agent website, which is based in Cologne, Germany, with major offices in London, Paris and New York. It began life as an offline travel agency, and the company itself was founded back in 1972. While the HRS.com service provides hotel bookings for both private travellers and business travellers, it places a clear focus on the latter group, promoting a special 30 percent discount, or ‘business rate’. It can, therefore, be an excellent choice for hotels which are prioritising business customers too. Click here to list your hotel to HRS.com. Airbnb is an online hospitality marketplace, which allows members to offer lodgings or to book overnight stays. Its offerings primarily consist of home stays, although the brand has branched out and now lists hotels too. However, Airbnb tends to be quite strict about the hotels it will allow to be listed on its platform, as they must meet certain criteria. Typically, a hotel will need to prove that it has unique design characteristics, that its rooms have a clear local influence, and that guests have access to shared common spaces. Click here to list your hotel to Airbnb.com. Orbitz.com is an online travel metasearch engine and OTA, which serves as a subsidiary of the Expedia Group. Although it is primarily geared towards the American market, it provides a range of international travel options. Aside from offering hotel bookings, it also caters for flights, car rentals, cruises and package deals. The service was acquired by the Expedia Group in 2015, with several sources stating that it would help them to compete with the Priceline.com component of Booking Holdings’ business model. Click here to list your hotel to Booking.com. Since Orbitz.com is part of the Expedia Group, your hotel will visible on Orbitz.com when listed to Expedia. Click here to list your hotel to Orbitz.com. LateRooms.com is a dedicated hotel reservation platform, which is based in Manchester, in the United Kingdom. The company was founded in 1999, but did not offer online hotel bookings until 2002. As a platform, LateRooms.com places a clear emphasis on attracting customers looking for last minute deals on overnight stays, including bookings for the very same day. In many cases, these late deals are sold at a discount. As a result, it can be a solid option for hotels that are prone to having spare rooms that they need to fill. Click here to list your hotel to LateRooms.com. The TripAdvisor.com platform is an online travel and restaurant service, which is primarily focused on reviews and other user-generated content. However, it also has a built-in hotel booking service. The company itself has its headquarters in Needham, Massachusetts, in the United States, and was founded in 2000. Click here to list your hotel to Booking.com. TripAdvisor works with third-party connectivity partners, displaying live hotel prices and availability listings. The website also has an advertising partnership with Expedia and its Priceline.com subsidiary. Click here to list your hotel to Tripadvisor.com. Based in Shanghai, China, Trip.com is the largest online travel agency in the country. It primarily targets the Chinese market, including both domestic and international travellers, and the vast majority of its sales come from people living in the cities of Shanghai, Beijing, Shenzhen, and Guangzhou. Trip also has a strategic partnership in place with Booking.com, which allows the Chinese company to access Booking.com’s global portfolio, and allows Booking.com to gain greater access to the Chinese market. Click here to list your hotel to Trip.com. The Travelocity.com brand was founded in 1996, making it one of the older active OTAs on the market, and it too is now owned by the Expedia Group. The company has its headquarters in Dallas, Texas, in the United States. In terms of how it differentiates itself from its parent brand, Travelocity places an increased focus on package deals and on providing positive travel experiences. One of its unique features is a ‘Travel for Good’ scheme, where customers are rewarded if they participate in volunteering opportunities while on their travels. Since Travelocity.com is part of the Expedia Group, your hotel will visible on Travelocity.com when listed to Expedia. Click here to list your hotel to Travelocity.com. How to Distribute Your Hotel Inventory With All Online Distribution Agencies? For hotels that opt to use online travel agencies, one of the major challenges involves distributing a hotel inventory to as many online platforms as possible. The best solution to this problem is to use a hotel distribution channel management solution, which allows the various distribution channels to be managed from a single place. More information about hotel distribution channel managers can be found in the article “Hotel Distribution Channel Manager: What Are the Advantages?”. Online travel agents play a key role in the hotel industry, serving as a useful distribution channel, especially in the modern, digital age. The 12 OTAs mentioned above are among the best-known and most popular platforms of this type, and will provide hotel owners with the best possible chance of increasing hotel bookings.